So much for any additional life support for A Life In The Theatre. Sadly, it's time to write the obit as they're pulling the plug more than a month early. Today, a closing notice was posted for the limited run revival of David Mamet's slight, 33 year old work presented for the very first time on Broadway this fall. The show will close on November 28. On paper, it certainly sounded brilliant, particularly with Neil Pepe directing Patrick Stewart and T.R. Knight, both extraordinarily gifted actors in their own right. Yet, it seemed extremely tiny, even in its smallish Broadway house. It also seemed woefully thin, not only to me, but also to a host of critics. Even worse, the show has been languishing near the bottom of the weekly grosses for the past couple weeks (and I'm sure this week's box office totals will bear similar results). 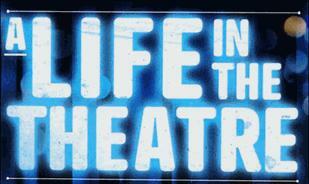 In fact, with one notable exception, A Life In The Theatre was not only the lowest grossing show on Broadway for the week ending October 31 ($218,150), but also at the bottom in attracting capacity crowds at 39.3%. When the show closes, it will have performed 56 regular performances. As Ben Brantley of The New York Times has so eloquently stated, "And now when I see a good production Off Broadway, I shudder to think that it may soon be pushed onto a big, unloving stage where it may well die from exposure." As much as I love Broadway, not every play or musical -- including ones I love -- belongs there.